Arguably one of the most colorful and impressive regions in the sky, this image shows a 25 by 15 degree section of the Serpent Bearer constellation of Ophiuchus as well as Scorpius, the Scorpion. Prominent at the center of the image is the Rho Ophiuchi Cloud Complex. The cloud complex includes the bright yellow star, Antares, whose light reflects off the surrounding yellow nebula IC 4606. Just above Antares is the blue reflection nebula IC 4605, and to the right of Antares is a red emission nebula. Above Rho Ophiuchi is the beautiful blue reflection nebula IC 4592 - the Blue Horsehead which shines by reflecting the light from Nu Scorpii. Towards the lower right of the image lies another blue reflection nebula, Vdb 99. This reflection nebula is surrounded by a faint red emission nebula, Sharpless 2-1. 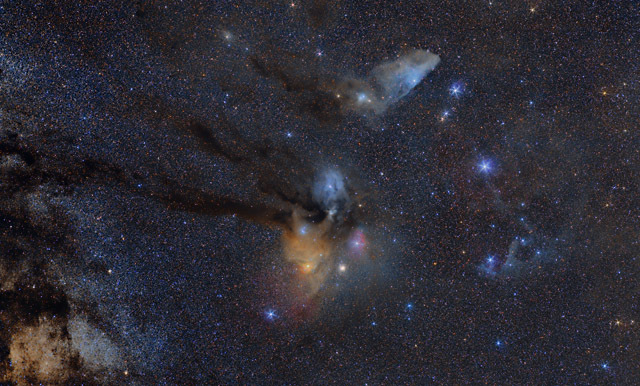 Streaming to the left of the Rho Ophiuchi Complex and the Blue Horsehead are several dark nebulae. These nebulae consist primarily of dust that obscures the light behind the nebula. The most conspicuous dark nebula is B44, The Dark River. In the lower left of the astrophoto is a combination of very bright patches and dark patches. This corner of the image shows the Milky Way Galaxy only 3 degrees from the center of the galaxy. The bright patches are actually very dense concentrations of stars, while the dark patches come from additional dust regions. This image is a composite of a 50mm base image which provides the entire field of view. Then, I blended in three 200mm detail images of Rho Ophiuchi, the Blue Horsehead, and Vdb 99. The detail images were composited with the 50mm luminance with opacities of typically 25%. This provided some finer detail in these regions of the image. All told, the image encompases a total of 32 hours of exposure. Software Used Images Plus 5.0 for camera control, Images Plus 5.5 Beta for calibration, stacking, digital development, star shrinking and halo reduction, smoothing and noise reduction. Photoshop CS5 used for levels and curves, high pass filter, star shrinking, screen mask invert, lens correction, lab color, vibrance, saturation adjustments, and selective color. HLVG for addiitonal color correction, Gradient Xterminator for gradient removal. Carboni Tools for additional noise reduction, and smoothing. Registar for aligning stacks and for color channel alignment. Focus Magic for focus restoration. Notes Wide angle images of star fields close to the Milky Way present some difficult challenges. One of the trickiest things to do is to stretch (brighten) the images without having the stars overwhelm the field of view. For this reason, I was very careful in processing this image with a goal of keeping the stars under control. While there are still a spectacular number of stars in the image, I believe I achieved a good balance of stars and surrounding nebulae. I think the color and contrast of objects in this widefield image make for an extremely impressive field. I put a lot of effort into this image, and I'm rather pleased with the final result. This image was published in the Fall 2013 issue of Amateur Astronomy Magazine. This image was also published in the Reader's Gallery section of the August 2014 issue of Astronomy Magazine. This image was published as the cover image of the Summer 2014 issue of Amateur Astronomy Magazine. This image won first place in Astrophotogallery.org's Easy-Widefield category for May 2013.